One of the most important developments in Japanese Samurai warfare during the Sengoku Period was the emergence of large-scale infantry tactics in an exact parallel to the similar trend that was happening in 16th century Europe. However, although infantry warfare became increasingly common, it never completely replaced cavalry warfare, largely because successful generals had to use a combination of both to their best advantage. The stimulus for this development was the practice of using foot solders as missile troops, a factor accelerated by the introduction of European-style firearms, which men like Oda Nobunaga used very effectively. Somehow the samurai horseman had to hit back at their ranks, and needed to use his mobility and striking power to provide the shock of a charge against them. The problem was that a samurai traditionally carried a bow, which was an encumbrance in hand-to-hand fighting, and even if the bow was given to an attendant, swords were of limited use from the saddle. So the bow was abandoned in favour of the spear, and the mounted archer gave way to the mounted spearman. Some mounted archers were still retained, who operated as mobile sharpshooters, but the majority of samurai now carried spears fitted with blades that were every bit as sharp as their swords. For the first time in Japanese history, a samurai army could deliver something recognisable as a cavalry charge. As noted above, Takeda Shingen was the greatest exponent of the new style of mounted fighting, whether it was against archers or the musketeers who began to replace bowmen from about 1560 onwards. The initiative had shifted back in favour of the mounted man, at least until the time of Nobunaga’s victory at Nagashino. 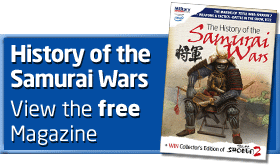 But what was the reality of mounted samurai warfare? If horsemen charged the enemy on their own, they could provide a reasonable impact, but in order to achieve a complete breakthrough on the battlefield they had to go into the attack along with samurai on foot. It is also important to note that the horses of those days were different from the ones we see in samurai films. The Sengoku Period horses were much smaller, as was confirmed in 1989 when archaeologists dug up a horse’s skeleton at Tsutsuji ga saki, the Takeda capital. Its height to the shoulder was 120 cm, and its weight was estimated as 250 kilos, which compares to 160 cm and 500 kilos for a modern thoroughbred, so the shock of a charge hitting the enemy ranks would have been much less. The speed of a modern thoroughbred would also be greater, and as the Sengoku horse had to bear an armoured horseman, the pace would be further reduced. They were usually accompanied by soldiers and attendants on foot, running as fast as they could, and who could not be left behind, so the impact of a Sengoku cavalry charge cannot have been as severe as it is popularly depicted in movies. As well as arming the footsoldiers with muskets, the successful generals also disciplined them, giving them armour and helmets and rewarding them for service. In these ways, the samurai class expanded and became more professional, until under the Tokugawa the separation between the fighting samurai class and the agricultural farming class was made total.